 Upon receipt of a bachelor’s degree, students are expected to assume regional, national, or international positions in the development, delivery, or administration of sport or sport education programs. Those already employed in sport or sport education are expected to have enhanced skills, knowledge, and understanding, which will promote the advancement of sport, sport education, or sports sciences. A cumulative grade point average (GPA) of 2.0 is required for graduation. The Academy’s mentorship program enables a student to get in-depth training under the direct supervision of a leader in the student’s chosen field. Mentorship study can provide many opportunities for valuable practical experiences, since the student can select, within established guidelines, both the site and the type of experience desired. The flexibility of mentorship study is particularly important for the professional who seeks career advancement but prefers to remain employed while pursuing a degree. Experiencing a mentorship is an excellent opportunity to work side-by-side with experts in the sports profession. The mentorship could provide a student an opportunity to build a network with professionals in the industry. Students should attempt to procure a mentorship in their local area. Students are advised to contact the Mentorship Office to discuss possible mentorship ideas prior to initiating the necessary paperwork. The mentorship is required in the B.S.S., Ed.D. and some MSS programs (all MSS students do have an option to complete the mentorship), however due to state authorization laws in certain states, some students may not be allowed to complete a mentorship. Those students must contact their advisor for details. For full details regarding the mentorship program, students should download the Mentorship Handbook from the student portal. Upon receipt of a master’s degree, students are expected to assume regional, national, or international positions in the development, delivery, or administration of sport or sport education programs. Those already employed in sport or sport education are expected to have enhanced skills, knowledge, and understanding, which will promote the advancement of sport, sport education, or sports sciences. Justifying the application of ethical principles in practical situations. A cumulative grade point average (GPA) of 3.0 is required for graduation. Student completing the thesis option in their programs of study will successfully complete a portfolio. It will help guide the student through his/her program of study. It will focus the students’ interests, sharpen their research experience, increase the breadth of training and expand their scholarly credentials by blending practical life experiences and professional work history within their program of study. It will serve as the comprehensive evaluation of the students’ learning and be a clear portrait of the student in terms of interest, scholarly ability, writing skill, independent and critical thinking, and research capability. The purpose of the Comprehensive Examination is to confirm that students have met the goals of the master’s degree program. Goals are outlined in the “Master of Sport Science Catalog,” as well as specific competencies formulated to meet those goals. When students are able to demonstrate knowledge of sport science and a specific knowledge in their fields of expertise, students, faculty and administration can be assured that the goals have been met. Upon receipt of a doctoral degree, students are expected to assume regional, national, or international positions in the development, delivery, or administration of sport or sport education programs. Those already employed in sport or sport education are expected to have enhanced skills, knowledge, and understanding, which will promote the advancement of sport, sport education, or sports sciences. All doctoral students must complete a doctoral portfolio to reach candidacy. It serves as the comprehensive evaluation of the students’ learning. Mentors, defined as experts in the sport field evaluate each bachelor’s candidate during the mentorship process. A series of 10 Likert scale questions are asked evaluating students preparedness, critical thinking skills, skill set, and working knowledge of sport. A value of 1 represents a response of Strongly Disagree; a value of 5 represents a response of Strongly Agree. 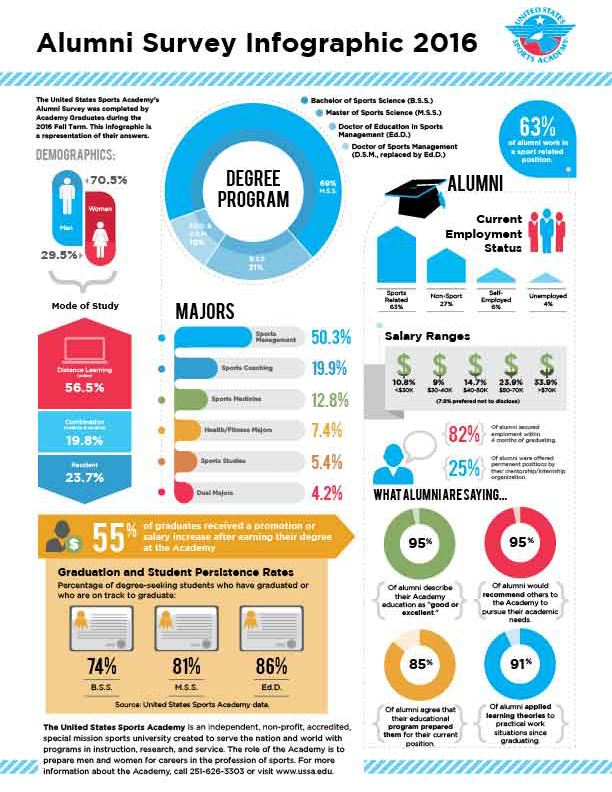 • 94% of graduates are currently employed. • The latest 3 year cohort default rate for 2012 is 4.7%. 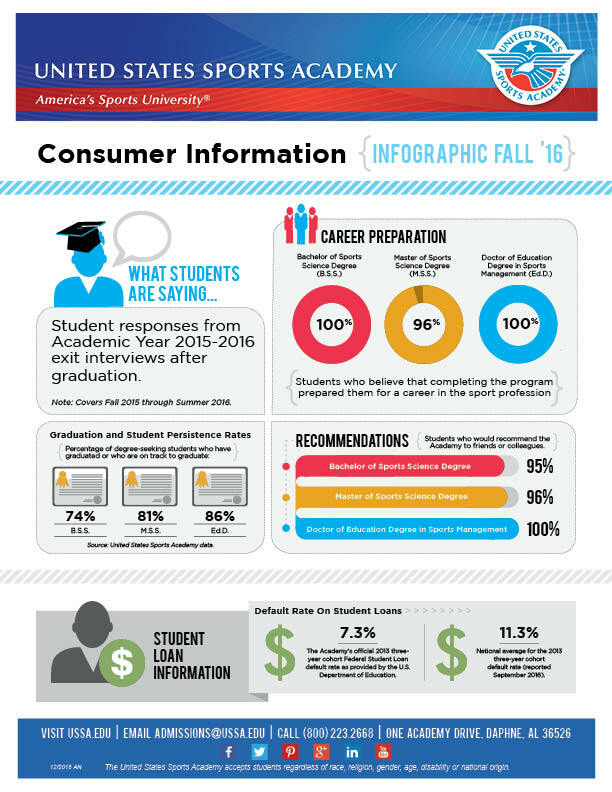 Below are the findings of our most recent exit interviews from graduates for Fall 2016.